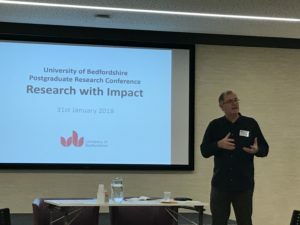 The University of Bedfordshire held the Postgraduate Research Conference 2018, titled Research with Impact. There were a lot of presenters from a variety of disciplines, and this fact generated great ideas and made the day productive. I really enjoyed my presentation «Researching from within practice: The impact my research has on my clients and myself as a therapist», as well as the interesting questions afterwards. In occasions like these, there is always the opportunity to reflect on the work I do and how I can present it in a meaningful way to engage a broader audience. 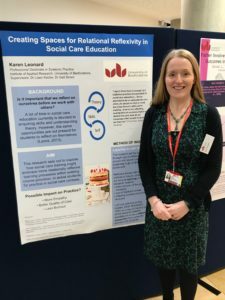 Congratulations to all presenters, but special congratulations to my colleagues from my peer cohort, Monica, who was brave enough to go through a speed Pecha Kucha presentation, and Karen for her beautiful poster.